Since Phoenix Showcontroller has been taken over by Pangolin beginning of 2013, the development of both software products has been harmonized and Phoenix Showcontroller was developed further. Parallel to the software improvements Laserworld developed an own high performance solution that brings Phoenix to a high professional Network control level: With the new MicroNet Slim it is not only possible to control standard laser light systems, but also high end projectors with more than three different colored laser sources (up to 6 color!) can be operated. The performing processor allows resolution of true 12 bit on both scan axis and scan speeds up to 150kpps. Due to the great resolution color fading and slow movements can be displayed extra smooth and step-free. The MicroNet Slim comes with an integrated SD Card and player, so standard ILDA frames can easily be played back. But of course the main control option is the Network control (standard Ethernet). 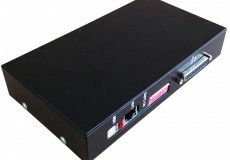 Several Micro Net Slim boxes can be addressed from one control computer by simply using a standard network switch. For addressing the very MicroNet Slim interface, the respective IP address can easily be set with dip switches at the unit. If Network control is not possible or necessary, the integrated DMX interface can be alternatively used to trigger the patterns on the SD card. This allows for seamless integration into existing lighting setups. The DMX signal can also be sent from the Phoenix software to the network interface, so the DMX Out at the interface can be used to control additional lighting or stage effects through the software too. The other way round it is possible to remote control the Phoenix software through the DMX IN at the MicroNet interface. These multiple control variations make the MicroNet Slim a great solution for fixed installations and mobile use. The enclosure is very durable and it is possible to use two different power sources for the unit: Either USB power or an external 9V DC power adapter (included in delivery). The MicroNet Slim is a true high performance network card for high professional requirements. 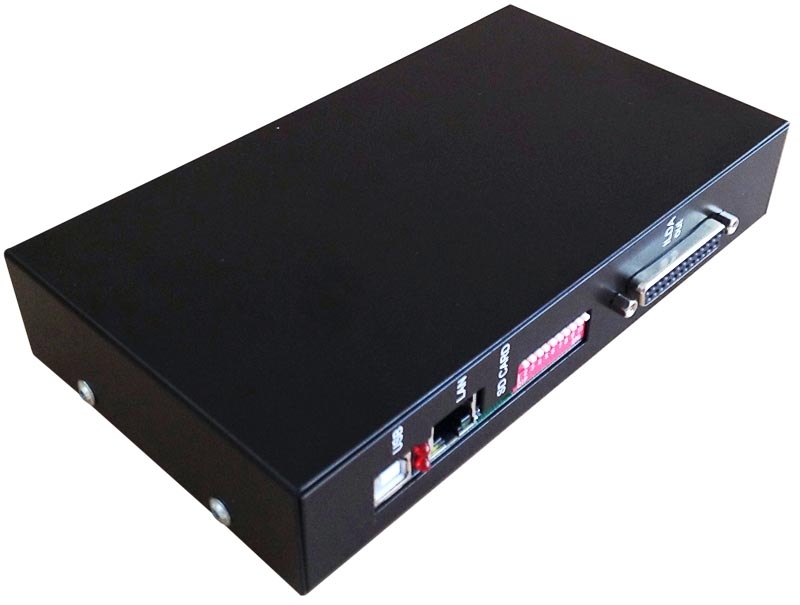 - Full LAN compatibility, signal can be distributed through normal LAN switch. - Flexible IP address setting: fixed address, DHCP, or AutoIP. - 12 bit resolution on x and y axis scanning. - 6 color control capable. - DMX IN, DMX Out. - USB power or 9-24V DC power. - Up to 16 devices can be used in parallel for multi projector laser shows.